Up for bid is a really nice wood base display stand and display label for a MEGALODON TOOTH. We designed this unique product because the other megalodon tooth display stands that are out there, where the tooth is displayed standing up, can be unstable and the tooth can fall over and become damaged. We had that happen to a nice megalodon tooth of ours. So we designed this display stand upon which the megalodon tooth is placed to lay flat. If you own a megalodon tooth fossil, a display like this would really enhance your fossil! We have included with the photos some examples of how megalodon teeth look on the display stand and how both large and small teeth can be displayed. THE MEGALODON TEETH PICTURED ARE NOT INCLUDED WITH YOUR PURCHASE. I am so confident that you'll love this item that I offer a 100% money back guarantee - when you receive the item if you're not happy for any reason, send it back within 14 days and I'll refund your money. For customers in the USA, I will pay for the returned shipping as well - for international customers, returned shipping will be the responsibility of the buyer. THE MONEY BACK GUARANTEE IS NOT AVAILABLE FOR ITEMS THAT HAVE BEEN ALTERED IN ANY WAY BY THE BUYER. We are happy to combine shipping! I'm also happy to hold off on shipping if you want to watch my auctions for several weeks and then combine shipping in the same box. PLEASE NOTE: We appreciate the business of our international customers! We request that international buyers have signature confirmation tracking or insurance on their packages. PLEASE INFORM US when you make a purchase if you would like to add signature confirmation or insurance to your order, and we can let you know what the additional cost would be. Packages may still be shipped internationally without signature confirmation or insurance, but the buyer would assume responsibility if the package was lost or stolen. The buyer is responsible for any customs or duty fees that are charged by their country. THANK YOU VERY MUCH FOR LOOKING! Check out the other items in our store at http://stores.ebay.com/Fossils-Meteorites-More. Put us on your favorite sellers list and watch our auctions that end each Saturday! For other uses, see Megalodon (disambiguation). Model of the jaws of megalodon at the American Museum of Natural History. Megalodon (/ËˆmÉ›É¡É™lÉ™dÉ’n/ MEG-É™-lÉ™-don; meaning "big tooth", from Ancient Greek: Î¼Î­Î³Î±Ï‚ (megas) â€œbig, mightyâ€� + á½€Î´ÏŒÎ½ (odon) (from á½€Î´Î¿Ï�Ï‚ (odous) "tooth"), is an extinct species of shark that lived approximately 28 to 1.5 million years ago, during the Cenozoic Era (late Oligocene to early Pleistocene). 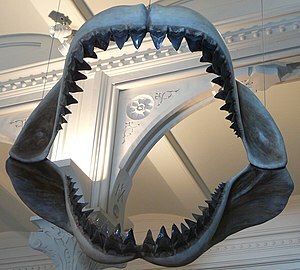 C. megalodon is regarded as one of the largest and most powerful predators in vertebrate history, and likely had a profound impact on the structure of marine communities. Fossil remains suggest that this giant shark reached a maximum length of 14â€“18 metres (46â€“59 ft), and also affirm that it had a cosmopolitan distribution. Scientists suggest that C. megalodon looked like a stockier version of the great white shark, Carcharodon carcharias.